Here, as promised, is my post about BookCon 2017, with emphasis on exhibitors, to be followed in a week by another on attendees. First, what is BookCon? Advertised as being “where storytelling and pop culture collide,” BookCon is an annual book fair, usually held in New York at the Jacob K. Javits Convention Center following BookExpo. So what is BookExpo? BookExpo is an annual event, held this year at the Javits Center on Thursday, June 1, and Friday, June 2, where the book trade talks to itself. The public is excluded, for this is a gathering only of those involved in the book trade, meaning publishers, authors (especially bestsellers), agents, and librarians, as well as filmmakers looking for the next blockbuster book that might be made into a blockbuster film. It’s all about networking, keeping in touch with old contacts and developing new ones, and sniffing out the latest in publishing trends. It is most definitely not about finding an agent or publisher, and to approach someone on the floor with this in mind is to brand yourself a pushy newbie and suffer the consequences. BookCon, which only dates from 2014 and follows hot on the heels of BookExpo, is an event where the book trade welcomes consumers (hence “con”) with open arms, and feasts them with titles old and new, author talks and signings, giveaways, and geeky book-related products. This year it was held at the Javits on Saturday, June 3, and Sunday, June 4. So if the trade excludes the public for the first two days, it then repents of its action, rediscovers readers, and throws its gates wide open. And the event is BIG: held last year for a single day in (to the dismay of many) Chicago, it expected and presumably got 10,000 visitors. But this year, held for two days in New York, which likes to do things BIGGER THAN BIG, it anticipated 25,000, of which I was one. So ill informed was I, as a very small published author, that until last winter I had never heard of BookExpo or BookCon, and had never set foot in, or even glimpsed from a distance, the Jacob K. Javits Convention Center (named for a deceased but well remembered U.S. senator from New York) at Eleventh Avenue and West 34th Street, on the booming west side of Manhattan. What alerted me to these events was an unsolicited e-mail offer from some outfit I’d never heard of, promising – for a tidy sum – to get me into the book event and connect me with an agent. Though I was justifiably skeptical of the offer and deleted it, it occurred to me that maybe I should look into the matter myself, with the result that, after much time spent online, I enrolled in BookExpo as an author to the tune of $400, which I thought a bit steep, since other participants got in for less, and without authors there would be no such event, no publishers, and no agents either. Then, poking about further online, I realized that BookExpo was not for me, since what I needed at the moment was readers, not contacts with agents and publishers, who today couldn’t be bothered with small fry like myself. Result: I got my $400 refunded and, by forking out a mere $2,000, rented a 10' x 10' exhibitor’s booth for BookCon. Sheer folly, of course, since I had no idea what I was getting into. But it would look good in a query letter to small publishers, who want to know an author’s marketing plan, and it would satisfy my modest appetite for adventure. So began the BookCon for Dummies phase of my adventure. 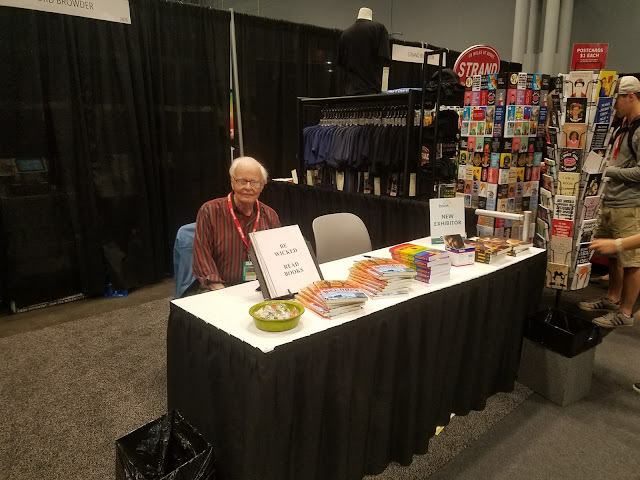 By way of preparation, I saw on an online plan of the show floor that my booth #2876 was in the BookCon section -- the section for small presses and indie authors who wouldn't attend BookExpo -- way up in the northwest corner of the floor. I wondered if visitors would find their way to me in what looked like a remote backwater, but when I learned that the famous Strand Bookstore would have a big booth right next to me, I breathed a sigh of relief: they would draw traffic into my aisle. 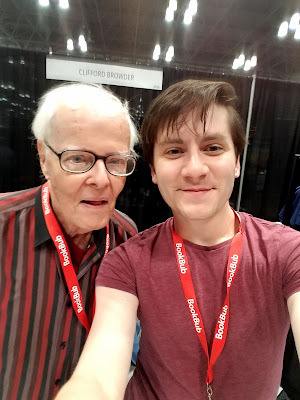 On the BookCon website I also watched two videos showing hordes of visitors swarming into the one-day 2016 show in Chicago, and informing me that attendees were 52% female millennials, the rest being older women and, in smaller numbers, men. A problem: these young women read genre fiction -- romance, sci-fi, fantasy, young adult, horror, thrillers -- which I don’t do. So could I entice them into historical fiction and nonfiction? KNOW YOUR READERS is standard advice to authors these days, so for each of my three offerings I tried to do just that. And how many books did I hope to sell? Not many, by bestseller standards, since female millennials were probably not my audience. I hoped for 40 or more sales, would consider 20 disappointing, and decided that 30 would be minimally acceptable. A modest projection, I thought, though I didn’t dismiss the grim possibility of my sitting glumly in my booth, totally neglected by the multitudinous swarm of young women hurrying elsewhere. Such were my assumptions about readers and sales. Regarding readers, I was completely and outrageously wrong. Next, learning who some of my future neighbors in the BookCon section of the exhibit floor would be, I contacted them by e-mail and, being in the BookCon for Dummies stage, asked if they had any advice for a newbie. They were all delighted to hear from me and offered lots of advice. Attendees love swag, meaning free stuff, so put out lots. I decided on candy and at first thought about Hershey’s Kisses, since everyone loves chocolate, and the double entendre possibilities were endless: “Would you like some of my kisses?” or “Don’t leave without a kiss,” and so on. But then I thought about fingers smeared with chocolate getting near my beloved books and opted instead for hard candy, specifically, lollipops with lots of colors. A big heap of it in a bowl on the table in my 10’ x 10’ booth. I would probably be the oldest exhibitor there and meant to play it to the hilt. Some attendees would want to read the blurb and decide on their own, but others would ask what it was about, so exhibitors should be ready with a good spiel to snag their interest. So I worked up a pitch. Example: for the New York stories: “All about the good side and the bad of New York. My mugging in Central Park was definitely not good, but it made me a real New Yorker – I had joined the club.” Hopefully it would get a laugh or at least a smile. I had thought it might be cool to handle it all myself, but who would cover for me if I ran to the john or went out for lunch? And how would I get all my books to the Center? So I asked my young friend Silas Berkowitz, whom I had met a year before at a college alumni gathering, and he jumped at the chance, seeing it all as an adventure. He works for Microsoft, has a flexible schedule, and is tech-savvy, so he seemed a perfect fit. His knowledge of tech would let him handle credit card payments and do something called lead retrieval, scanning attendees’ badges to obtain their e-mail addresses for future contact. And for all the years between us, we laughed at the same things, and our interests overlapped. With me at 88 and him at 26, we would be an odd couple, though “couple” is hardly the word, since we were not in the usual sense of the word (honni soit qui mal y pense) a couple, just friends. The odd couple. No need to say who's who. Of course, that goes without saying. But from my experience at the Rainbow Book Fair in 2012, and stories my artist friend Henry told of dealing with potential buyers, I know the woes of hawking your wares in person: someone shows an interest – even a keen interest – in what you're offering and then, having fueled your hopes of a sale, they walk blithely away. But BookCon is a festival, a fun time, so you have to squelch any feeling of annoyance or disappointment and hope for better. Sour looks and frowns are taboo. So flash your signs, offer them candy, smile, and have fun yourself; it will (hopefully) communicate. So much for advice. But how to get my stuff to the show? Exhibitors coming from a great distance contract with Freeman, the exclusive provider of freight services for the show, to ship their books and other stuff to a warehouse in Maspeth, New York, for later delivery, or they schedule the delivery so it arrives at just the right time at the Center. But one reason the show had tempted me from the start was that, living in the West Village, I was only a short ten-dollar taxi ride from the Javits. The move-in for BookExpo, with all the big publishers bringing hundreds of books and all kinds of stuff for their lavish displays, would be a frenzied horror, but the move-in for BookCon, the venue for small presses and indie authors like me who eschewed the delights of BookExpo, was very precise and limited: 5 p.m. to 9 p.m. on Friday, June 2, immediately following the close of BookExpo. So it was that Silas and I stacked three cartons of books in my aging laundry cart, plus more books in our shoulder bags, and through the wonders of tech (his idea, of course) summoned a car by Lyft to my very doorstep in the Village, and took a quick ride up to the Javits at Eleventh Avenue and West 34th Street. When we got out and made for the entrance, we took a quick glance around us and saw towering high-rises under construction nearby, dwarfing by their height the massive glass box of the Javits. The Hudson Yards just to the south of the Javits were definitely “hot” real estate; the whole West Side was booming. Inside, we found ourselves in a vast airplane hangar-like structure with huge stretches of space, big signs overhead announcing future events, and another giant sign, which we reached after a walk the equivalent of four city blocks, welcoming us to BookExpo and BookCon. We went at once to the registration counter and collected our red-ribboned exhibitor badges, without which we couldn’t get in, and hung them around our neck. But we had arrived a little before 5:00 p.m., when BookExpo ended and our move-in began, so we sat for a while nearby and met a couple visiting from China who wanted to see the U.N. building; the wife spoke English, so Silas gave her directions and we wished them well – a reminder of the international attraction of this city and the Javits. At the magic hour of five we entered the huge exhibit floor and trudged this way and that until we saw a distant overhead sign that said 2800. Since our booth was #2876, we headed that way and found a vast lot of ... nothing. Right where we thought we should be located: nothing! At least, nothing that looked like our little section of BookCon. So Silas took off to find the office of Reed Exhibitions, who were running the show, to learn what the problem was; returning, he said there had been a little error, but the booths would soon be installed. Exploring further, he found a very empty booth numbered 2876, but no table or chairs, and most of the nearby booths likewise empty. I in turn scurried off to query Reed and was told: “No need to worry. The tables are on their way.” So we waited in the empty booth, screened in back by an eight-foot black curtain, and on either side by a low three-foot black curtain. Not that the place was deserted; beyond the end of our aisle there was a wide entrance to the loading docks, and fork-lifts came from there lumbering down our aisle like looming monsters, carrying huge cartons to other distant booths with displays far more elaborate than ours. Finally, about 6:00 p.m., workmen began arriving with the missing tables, and once ours was installed at the front of the booth, similarly draped in black, we felt that the booth, though still minus chairs, at least existed. Wanting to get a good night’s sleep, we decided to go home, hoping that the chairs would also arrive. Which they did, for we found them there when we arrived on Saturday morning. Me in the booth, with the Strand postcards and magnets close by. in the best city on earth. This is the abrasive image that New Yorkers themselves like to project, but I would argue that New Yorkers are in fact less aggressive, less rude, just direct and to the point. How “with it” can you get? I predicted that the Strand products would fly off the shelves and the racks. Just across the aisle from the Strand was Book Beau, advertising itself as “the best way to love your books.” And what did it offer? A water- and stain-resistant "sleeve" (thin bag) to protect books and make them look beautiful; there were many patterns, and they were indeed beautiful. Next to Book Beau and just across from us was Kirin Rise Studios, with a big banner showing a young woman, maybe Asian, who was evidently the heroine of a novel by an author named Ed Cruz. Later I would learn that she lived in the year 2032 and used martial arts to fight bravely against government corruption and corporate greed – something we could use in 2017. But just what the booth was selling was never clear to me. Next to Book Beau was what Silas and I came to refer to as the “mystery booth”: a booth at first empty, with a sign reading TRADE SECRET TRILOGY / 13 CUTS, which meant nothing to us. Later an African American family with a young child came to occupy the booth, but what they were up to baffled us. They were evidently presenting a series of books, but by whom and about what was not apparent. Later I learned that the author was “DOJ,” which hardly cleared things up. And a small card that we retrieved from their table had texts in such small print, and in such fancy type, that their enterprise remained shrouded in mystery. And this right across from the flagrantly and deliciously commercial offerings of the Strand! Coming soon: Part 2 of BookCon, focused on attendees, plus notes on two of my BookCon neighbors, authors Jill Hynes and David Mammina. Who were the attendees, where were they from, what did they want, how did Silas and I interact with them, which books sold, and who were the buyers? Surprises galore; I would never have guessed. A great summation. I look forward to learning about your results! Thank you for sharing this with people who want to know about Book Con.